This is the first game ever to convert the classic arcade game Asteroids to full 3D. Many "3D" versions exist but are basically 2D games with nice 3D models and effects. This game however puts you in the middle of a full three dimensional asteroid field. 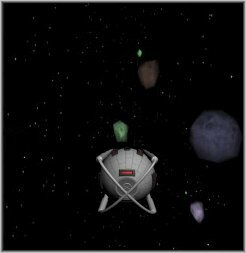 3D Asteroids is now FREE for Windows and Mac OS X ! If you have the demo version on your machine uninstall it then go here to download the full version. The problem with trying to navigate a 3D asteroids field is that you need to be able to see and dodge asteroids from all directions. Any asteroids coming in from over or under, to any side, or behind the ship cannot be seen until the last moment. While this may seem complicated at first, with practice is proves to be a unique gameplay experience. 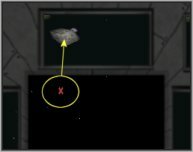 This red X stays constantly in the main Front view, and shows where the closest asteroid to your ship is. Keeping an eye on this at all times will direct your eye to the appropriate view needed to see and avoid the asteroid. 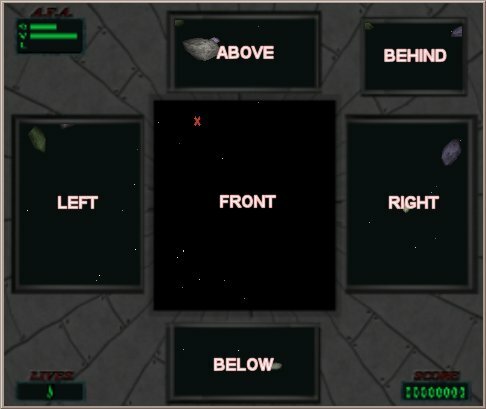 In the example above, the nearest rock is over the ship, and the red X tells us to look to the Above view. As an asteroid approaches your ship, you can hear what direction it is coming from due to the 3D sound effects in the game. Sometimes it is even possible to jerk your ship out of the path of an incoming asteroid, without ever seeing it at all ! 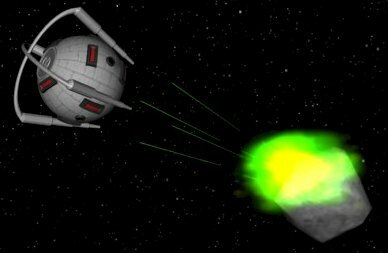 3D Asteroids has an unique thruster system for controlling the ship. This is easiest explained in the in-game Flight Training, so download the game and have a look. As you can see, this game is original and therefore unusual, so it can be difficult to learn. Give it some time, be sure to complete the in-game Flight Training, and have a read of the User Manual.